"How can I back up only messages on iPhone 8? I wonder if there is any way to do it since I’m afraid to lose them and they are very essential to me. I don't want to backup the whole data on my iPhone 8. It is time-consuming. Any idea?" The messages (including imessages) are one of the most important parts in our iPhone. People mostly communicate through messages or iMessages these days and avoid phone calls, especially for short conversations. Losing the messages can cause big trouble because you might have some important information in it. For all those who want to save only their messages to avoid any loss, scroll down to read this article and get the tutorial on backing up only messages on iPhone X or iPhone 8. If you are wondering after buying iphone 8 or iPhone X that how can you backup only messages on the device, here is how we are going to help you. Use iMyFone iTransor iPhone backup and restore tool (renamed from D-Port Pro), which is one of the most amazing tool to save data separately as well as create a full backup. It is the best option to backup and restore your data selectively. Using it, you can backup only messages on iPhone 8 or iPhone X. The tool helps you selectively backup and restore your iPhone. 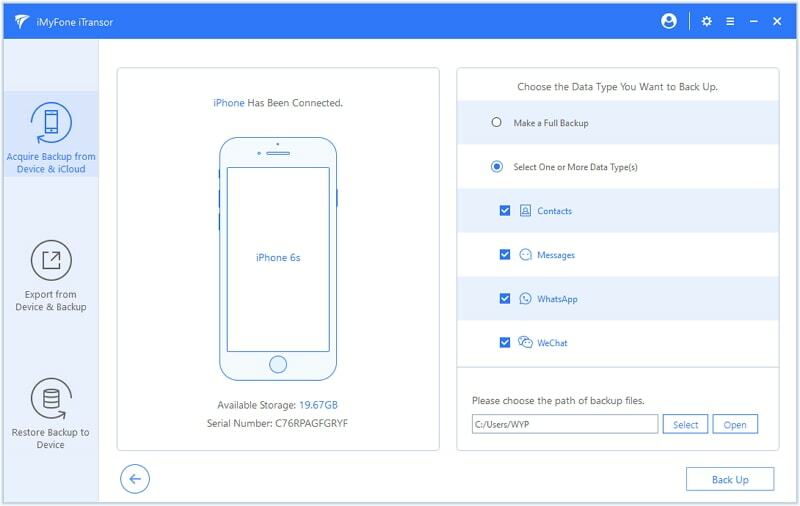 For example, it is easy to backup or restore merely messages, contacts, WhatsApp or WeChat data on your iPhone 8/iPhone X. You can use iMyFone iTransor to make a full backup of your iPhone without overwriting the previous backups. You can also extract 20+ types of data from iOS devices or the backups made by iCloud, iTunes, or iMyFone iTransor easily. It also allows the users to view the backup after creating it. The tool works completely with iOS 12/11 and older. If you wish to backup only messages on iPhone X/iPhone 8, not to worry, here’s the step guide to perform a backup of your messages only. Pre-requisites are downloading, installing and launching the software on your PC and to connect your device with the computer. Step 1 – In the main interface, hit "Acquire Backup from Device & iCloud" and then tap on "Back Up Device" option. Step 2 – Now, you are required to connect your device to computer and tick "Messages". Then hit on the "Back Up" button and your messages will then start to backup. Step 3 – Make sure that your device stay connected during the process. On completion, you will be notified that your data has been successfully backed up. 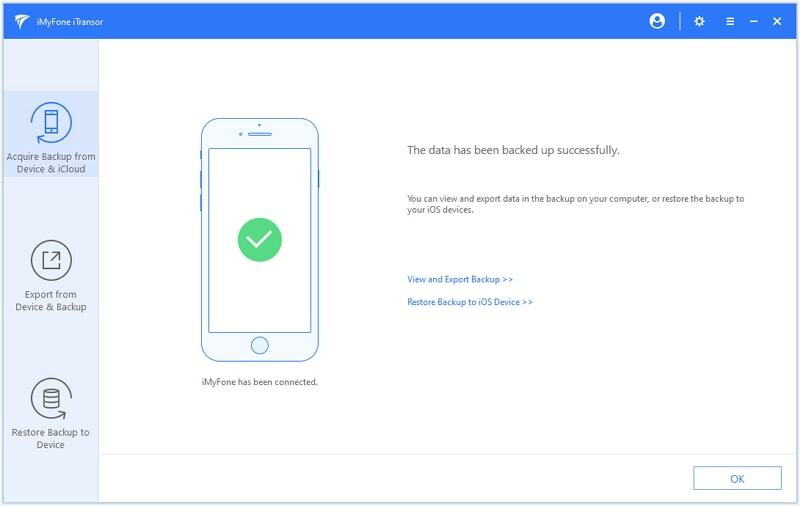 Since you’ve backed up messages of iPhone X/iPhone 8 with iMyFone iTransor, you can just restore the backup to your device without overwriting the other data on your device. 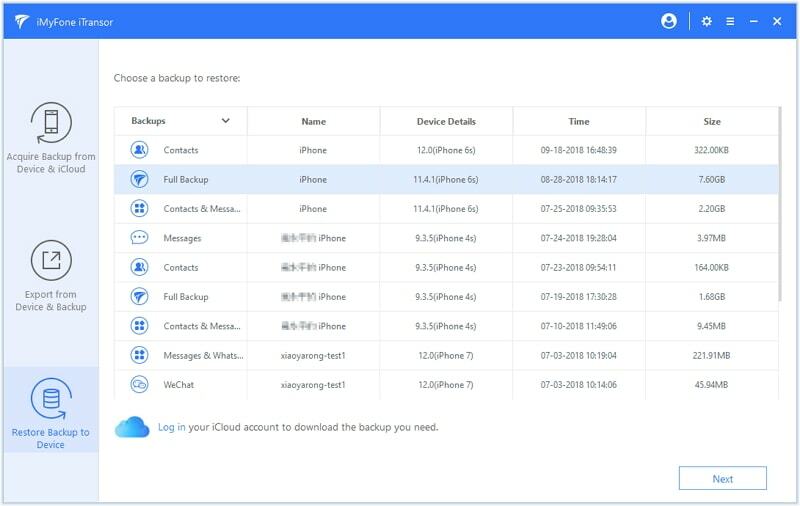 You can also just restore only contacts, WhatsApp or WeChat backup to your device if you have already made the backups before. 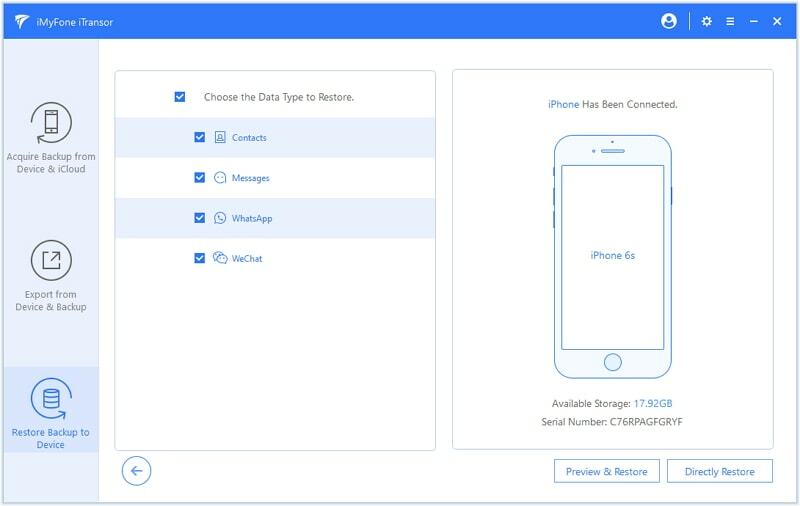 In addition, you can also restore the messages, contacts, WeChat data, WhatsApp data separetely from the backups made by iTunes, iCloud or iMyFone iTransor. Let’s also get familiar with the step guide to restore only messages from iMyFone backup files. Pre-requisite is just as same as mentioned in the previous guide. 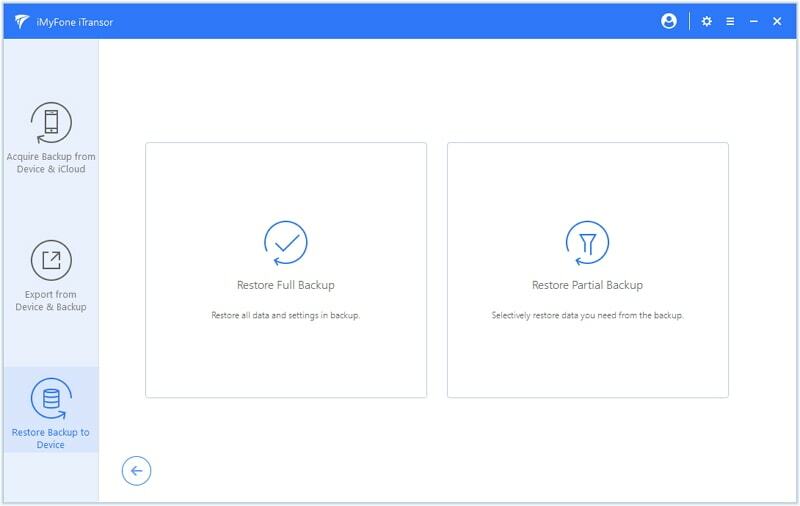 Step 1 – From the left panel, choose "Restore Backup to Device". Then choose the iMyFone Backup from the backup list and click "Next". On the next screen of iMyFone iTransor, tap on the tab named as "Restore Partial Backup". Step 2 – Then you will be asked to choose the data type which you want to restore from the backup. Since this guide is about restoring only messages, you are now required to mark only the "Messages" among other data types and then connect your device to computer. Now choose restore with previewing or restore without previewing. 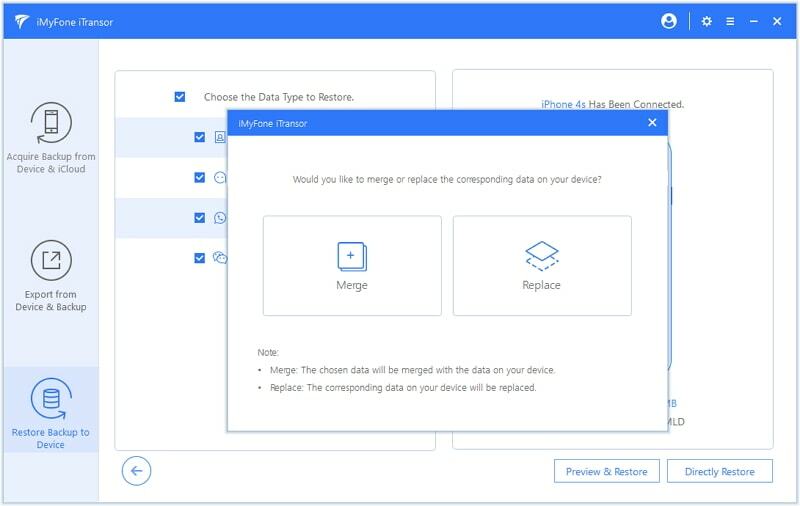 Step 3 – After selecting one restore model, the program will start to restore the backup.You can view the restored data on your device once the process completes. iTunes and iCloud being the standard backup methods,no doubt has numerous helpful features. But when it comes to backup only messages on iPhone X/iPhone 8, iTunes and iCloud do have some limitations as well. Let’s get to know about it. First of all, selectively backing up data on your device or selectively restoring data from previous backup both isn't possible either with iTunes or iCloud. If you use iTunes to backup your iPhone X or iPhone 8, your previous backup will be replaced by the new backup. You are not able to view the messages or other data in the backup made by iTunes or iCloud. 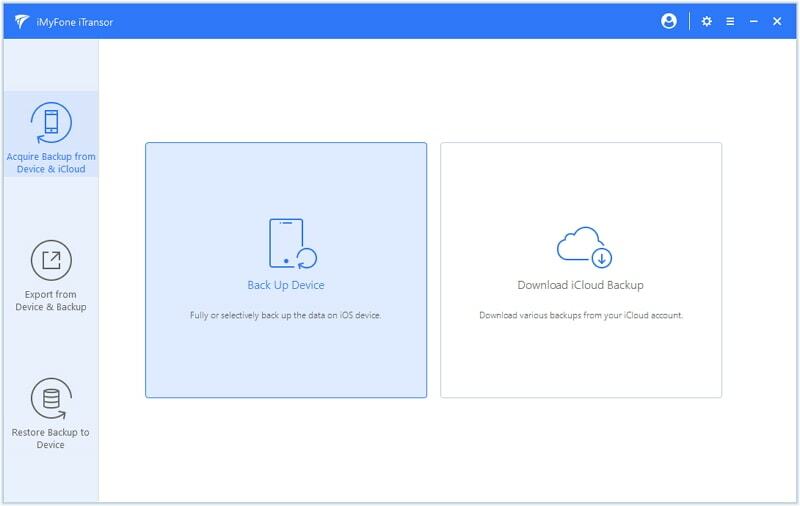 To backup messages or any kind of data with iCloud, you should have an stable internet connection or else you would not be able to enjoy the cloud services. Backing up data with iCloud is free only up to 5GB of cloud space, for more space you have to buy a monthly subscription plan for higher data storage space. This is all about how to backup only messages on iPhone X/iPhone 8. If you want to selectively backup anpp;d restore your iPhone X/iPhone 8, iMyFon iTransor iPhone backup and restore tool is recommended. We hope, you are now able to backup only messages on iPhone X/iPhone 8 without problem.